This cabinet card shows John Wesley Horner, (1834-1874). 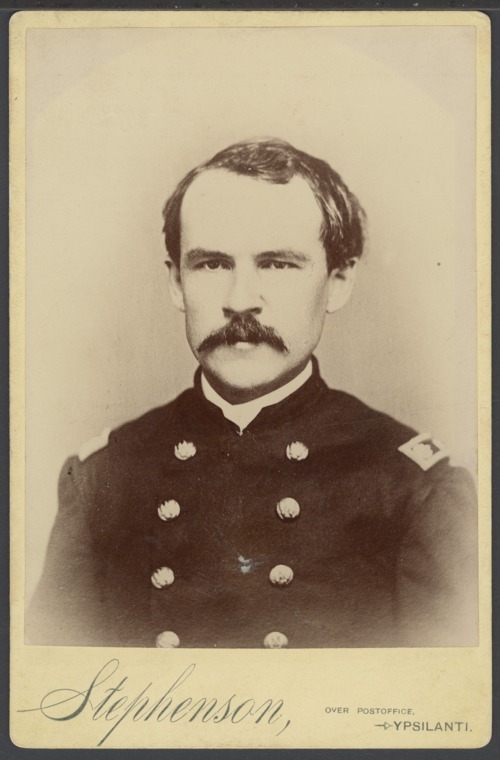 A veteran of the Civil War, he served as colonel of the 18th Michigan Infantry before becoming the fifth President of Baker University in Baldwin, Kansas, (1866-1867). Within a year of his presidency, he left Baker to pursue a career as a newspaper publisher. On January 6, 1869, Horner and A. S. Cory founded the Chetopa Advance, the second newspaper, in Labette County, Kansas. He held the positions of editor and publisher until he sold the business, in 1873, to L. J. Van Landingham. On August 16, 1874, Horner passed away at the age of forty during a stay at the Kansas Insane Asylum. He was later buried on the grounds of the asylum. The photograph was taken in Ypsilanti, Michigan.